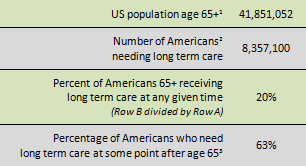 We’ve dug up some statistics to help you understand the likelihood of needing long term care. Chances are (63%) that you will need some type of long term care, if you live to be age 65. If you were to strike a distinction between what is possible and what is probable, you might say that something is possible if it has a 50% chance or less of occurring. But if it has more than a 50% chance of occurring, it’s a probability. If you think you will live to age 65, it’s a probability you may need long term care. The national average cost of a home health aide is almost $20 per hour. Multiply that rate by four hours per day and you get $80 per day, $2,400 per month, or $28,800 per year, and $144,000 over five years. That’s a significant amount of after-tax money for a modest amount of care in addition to regular expenses. Assisted living facility (private room) is $43,200 per year or $129,600 over three years. Nursing home facility (semi-private room) is $80,300 or $160,600 over two years.
. . . and you may need some of each type of care (home, assisted living, nursing home care). About 80%5 of people who receive long term care, receive it in their own home. Thereafter, if necessary, moving to some type of facility that offers the elevated type of care the individual needs. The question is this: do you have a family member whom is willing and can afford sacrifice a job, family time, etc., to provide care to you? 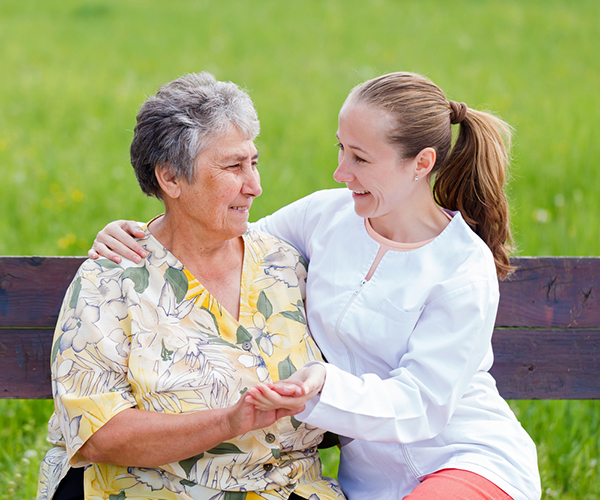 To inquire about long term care strategies, click here.